As featured at Barnes & Noble “Sunday Storytime” in New York City! In book four of the Sammy series, Winston takes Sammy to visit his friend Nabil in Morocco.Together they explore the sights and sounds of this enchanting country. After riding out into the Sahara Desert on a camel, will Sammy make it back home in time for dinner? In book five of the Sammy and the Magical Sandbox series, Sammy visits the beautiful country of India.There he meets a little boy named Vikram and together they ride colorful elephants, explore a golden temple and visit the famous Taj Mahal.Will Sammy make it back home in time for dinner? 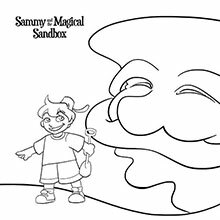 Stay tuned for further books in the Sammy and the Magical Sandbox series. Follow Sammy as he whirls his way to Paris, Morocco and MORE......COMING SOON!